Temple workers place a garland offered by devotees around the idol of Lord Ganesha, locally known as Lalbaugcha Raja, on the first day of the 10-day long Ganesh Chaturthi festival in Mumbai on Saturday, September 15, 2007. 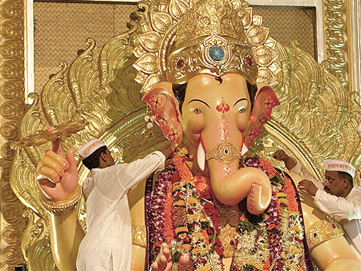 The Lalbaugcha Raja is one of the most highly venerated Ganesh idols in Mumbai. The festival ends with the immersion of the idol in the sea on the eleventh day.